Auburn Hills – “Denim Day,” was a huge success at Reliance One, Inc. As a fun and professional company, it was a great opportunity for the employees to support a cause while enjoying the perks of wearing jeans to work. Funds raised on Friday April 26th will go to HAVEN, an Oakland County organization that assists victims of sexual assault and domestic violence. The inspiration for this event was a result of L. Brooks Patterson encouraging the community to participate; the owners did not hesitate once they found out the great cause that the company would be supporting. As a result, Reliance One matched 100% of the contributions made by their employees. For more information about participating in Denim Day or making a donation to support victims of sexual assault and domestic violence, contact HAVEN at 248-334-1284, ext. 346. As active members of the community, Reliance One and its employees continue to host fundraising events to support local causes. Currently the team is working to sponsor a wish through the Rainbow Connection. The team is about a quarter of the way to their goal with a Cinco De Mayo Celebration planned for Friday May 3rd and another event scheduled at Air Time Trampoline on June 6th. For more information regarding the Rainbow Connection please visit: http://www.rainbowconnection.org. Auburn Hills – This past Saturday members of the Reliance One team participated in a Day of Service project for Leadership Oakland. Chris Cardenas was, “really proud to be a part of Leadership Oakland and the Day of Service activity we participated in on Saturday. It says a lot about Reliance One, Ognen, Ericka and Kelsey to volunteer time out of the busy Saturday to help the community. In just four hours we converted a lot of brush, weeds and dead trees into a clean sculpted landscape of flowers, shrubs and mulch.” Ericka Bush also enjoyed the experience by adding that, “it was a beautiful day not only with the weather but how everyone gave up their Saturday to make a part of the community look wonderful. The volunteers were from all ages and the knowledge and cooperation within the group led to a successful event. The organizers did a great job with ensuring we had enough materials and help available to complete the project as well.” The success of the project directly correlated with the great team work of the volunteers and organizers. Reliance One was privileged to be able to use their team building skills to help the community. Thank you to Chris Cardenas, Ericka Bush, Ognen Stamenkovik, and Kelsey Hines along with the rest of the volunteers for a job well done! Chad Toms has always been a people person. From growing up in Flint, MI to his first couple of jobs, Chad has a gift of connecting with people. 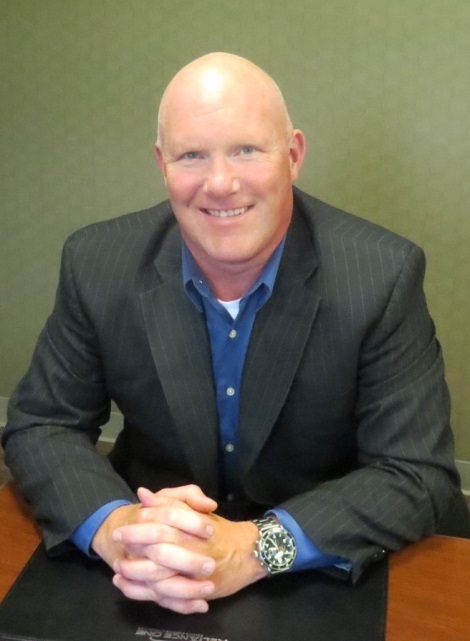 He has parlayed his connections, his ability to build relationships, his passion for the auto industry, and his sales expertise into a highly successful career at Reliance One. After joining the founders of Reliance One, Chad quickly moved into a sales territory with the goal of generating business to kick-start internal growth of new employees. Over the years, he established many relationships in the industry which are many of Reliance One’s top customers today. Based on his experience and relationships, Chad has taken on many new challenges. He opened new offices, markets, and launched new programs. In an effort to build on Chad’s successes, he was promoted to his most recent position, Vice President of National Sales. In this role, he is working hard to brand Reliance One on a national level with the largest of clients. After almost 10 years to the day from when he started working for Reliance One out of a house, Chad helped open a new state of the art 22,000 sq ft Headquarters for Reliance One in Auburn Hills, MI. Chad Toms is an eight time Contest Winner for Reliance One, holds two Most Valuable Player Awards, and has been honored with the “Reliance One Chad Toms Visionary Award”, which was named in recognition of his contributions to Reliance One. Chad continuously participates in community outreach and charitable activities. He is active in youth sports where he has coached many youth teams including football, baseball, softball, and basketball. He has also helped establish the Goodrich Football Boosters and the Goodrich Soccer Club. His wife of nearly 20 years and two children are active in the community along with him. Chad inspires everyone around him to interact with others, build relationships, and, “whatever you’re thinking, think bigger.” He continues to strive for success both personally and professionally. 600 People Hired, Looking for 200 More! April 5th, 2013, Auburn Hills, Mich. – Reliance One is looking to put 200 people to work in the next 30 days! We’re hiring test drivers to drive new and pre-production vehicles for a local Tier 1 Supplier. Test drivers simulate consumer use by driving along designated routes for 8 hour shifts. No experience is necessary for this position! We ask that applicants be over the age of 21 with a clean driving record and experience in the car for extended periods of time. We are currently seeking Part-time employees who have an open availability, that can work flexible shifts anytime between Monday – Sunday. 1st and 2nd shift positions are available, compensation is $8.25 an hour. These positions could evolve into a leadership role, with additional responsibilities, and a pay increase. The success of the program has grown so much since it began in 2011 that a new location in Warren has opened up. Both Auburn Hills and Warren programs are continuing to increase with advancements such as a driver training program and on-site employees. Come join our team of test drivers! Interviews are being conducted on-site at our Auburn Hills location. Send your resume to drivers@reliance-one.com in order to be considered or call (248) 393-1030 for more information.